I was nervous seeing Drinking Buddies for the first time. Without a doubt we are living in a moment of film history that has all but forgotten the value and worth of romantic comedies. Instead of digging deeper into relationship psychology, recent films have barely skimmed the surface, using relationships as a punchline for crass jokes and one note observations about how hard it is for people not only to get together but stay together. So imagine my surprise when Joe Swanberg, a member of the Mumblecore elite, not only explores the complexity of the relationships his characters have but also allows the conversation around them to be so natural that we get valuable information of who these characters are and what they want even through the pauses and awkward gestures. Kate (Olivia Wilde) and Luke (Jake Johnson) work in a brewery and are by all accounts perfect for each other. They goof around with each other on and off the clock, but are also at a point in their lives where they understand and perhaps begrudgingly accept the importance of being responsible working adults. They also both happen to be in relationships with other people. Kate is dating Chris (Ron Livingston) an established music producer, and Luke is engaged to Jill (Anna Kendrick), a special education teacher. When the four of them decide to spend a vacation weekend together it’s clear from the start that brushes with temptation will be close to the surface. But instead of a clean break, we are treated to a more thorough exploration of how people learn what they want in a partner and how they work through issues with their significant other. 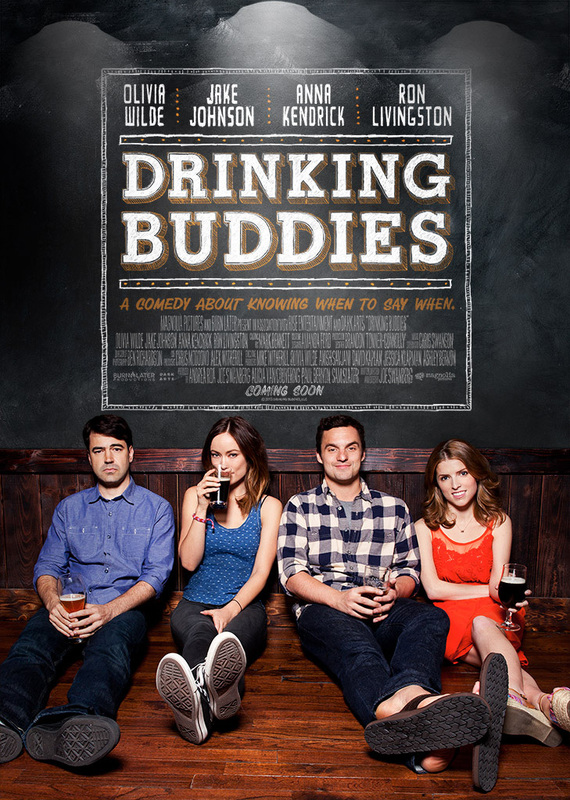 Having watched other films in the so called “Mumblecore” genre, I can say that Drinking Buddies is a lighter version for a more mainstream audience palette. The dialogue here is mostly improvised, and what results is a very realistic and sometimes awkward look into how people communicate with each other about very complex issues. I’m not sure you could get the kind of insight that comes from being natural in a highly structured script scenario. The vision for these characters is also one of the more realistic representations I’ve seen in quite some time. On the outset, each character seems to fit into a stereotype but by the end of the film our preconceptions are proven wrong. Wilde’s character is a particularly interesting and well-rounded character. She’s an emotionally free-spirit but much more self-possessed than we may have seen in any other film. Johnson’s Luke is the perfect counterpart as someone who is respectful of Kate’s autonomy despite not being a fan of her actions especially when they are an anathema to his own feelings for her. By having such nuanced characters that are based on real-world models, Drinking Buddies is able to draw conclusions that are less fantasy and more reality. As someone who longs for the day when romantic comedies are embraced once more, I found Drinking Buddies to be a step in the right direction. It’s a mature story that doesn’t stray into happily-ever-after territory and while we may not go to the theater just to look at ourselves in the mirror, when we recognize the face looking back it’s all the more satisfying. Drinking Buddies opens today in Philly area theaters.